What a difference a manager can make. Since Magath left Wolfsburg the club has slowly descended into the hardships of a midtable side. Steve McClaren is the third coach since Magath departed for greener pastures and the differences have been staggering. Wolfsburg have all but lost their European aspirations and are struggling against relegation this season. For a team with the most valuable squad next to Bayern they have seriously underperformed. Wolfsburg’s Hinrunde can be characterized by their streakiness. They started the season with three straight losses, albeit to three very good sides, before winning their next three matches. They then proceeded to lose three of their next four matches before ending with six consecutive draws, a record in the league this season. Their home form has left a lot to be desired, winning only three matches and only two clean sheets. Wolfsburg never had trouble scoring goals in the last couple of years but this season they have struggled to do so on the road, scoring only 7 of their 24 on their travels. Moreover, they have not been able to get the most out of their players and it has had a ripple effect on the rest of the team. New signing Simon Kjaer has struggled to adapt after his move from Italy while Arne Friedrich has spent the entire season nursing an injury. The Misimovic replacement Diego has also struggled to find the form he showed at Bremen and that has left Edin Dzeko with little to no support on top. Wolfburg's talisman Edin Dzeko. How will they cope without him? Best performer:Edin Dzeko. 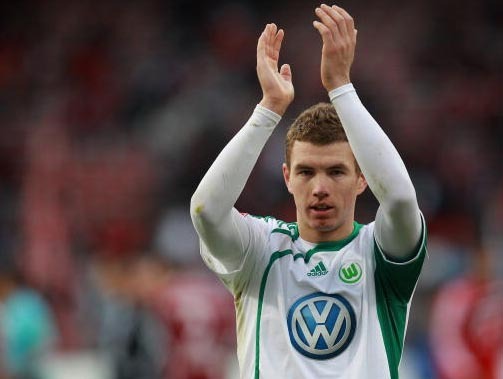 Wolfsburg’s true talisman and most consistent performer for the past three seasons now. Without his goals, Wolfsburg would contemplate relegation. It is no wonder that Europe’s biggest clubs have pursued him for two years now. After the sale of Misimovic and Magath as well as Grafite’s declining form he was given the captain’s armband and asked to shoulder a lot of the club’s responsibilities. In essence, he was expected to single handedly carry the team forward and considering the circumstances he has done so quite admirably. His inevitable departure to Manchester City will inevitably leave a big hole to fill. None of that detracts from the fact that Dzeko has held this club together since Magath’s departure. 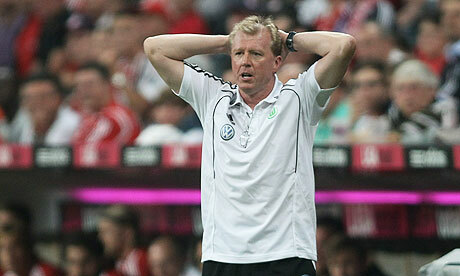 Biggest disappointment: Steve McClaren. This is an exception to the other players selected but is fully warranted. McClaren is the first English manager to coach in the Bundesliga and a lot of speculation surrounded his appointment and how he would cope after his stint in the Premier League and Holland. Considering he was brought in to provide the stability and confidence Magath provided it must be said that his tenure has so far failed to live up to expectations. McClaren has also failed to settle on a steady formation and line up, using everything from the 4-3-3 he used in Holland to the diamond Magath employed two years ago but never really getting the best out of the team and its players. Steve McClaren has his work cut out for him when the season resumes. Question – Can Wolfsburg survive the season? This is a rather open ended question and can mean a variety of things. As things stand Wolfsburg are on the edge of a proverbial cliff. The slightest nudge can push them into the abyss. There are also questions about McClaren’s ability to steady the ship and whether he has earned the trust of the players. There was an incident weeks ago between McClaren and Dzeko that might be symbolic of the grip the Englishman has over the team. Magath’s biggest accomplishment at Wolfsburg was his ability to get the most out of his players and in that respect McClaren has a lot to live up to. By the look of things, it does not seem like he will step out of Magath’s shadow successfully and if McClaren is indeed sacked it could just leave Wolfsburg even more vulnerable. A lot will also depend on how they use the money they received for Dzeko. 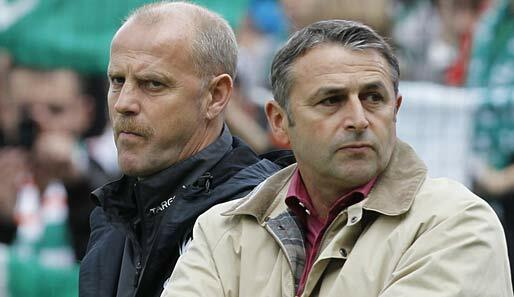 Thomas Schaaf (l) and Klaus Allofs (r) have a lot to ponder this January. A Bundesliga tragedy if there ever was one. With Bayern’s dominance in the league this past decade the Bundesliga is often touted as a one-team league but if there was one team to stake a claim as “Germany’s second team” it would be Bremen. No other team has performed as well over the last ten years or has participated as often in European competition. Yet Bremen has failed to make that impression consistently, either crashing out of Europe prematurely or disappointing domestically. To say that this season has been a nightmare is an understatement. Bremen has not scored in an away match in 538 minutes and have all but lost the attacking edge that has made them so prominent. Bremen’s defense has been horrendous to say the least. Their defense has always been a problem area over the last couple of years but their attacking game glossed over much of it. This season it has undeniably dragged them to their lowest point in years. Only Gladbach have conceded more goals than Bremen this season and they have kept only three clean sheets, all against teams who were then struggling to score. They have conceded two or more goals in 11 matches so far and have won a single away match, a far cry from the standards normally expected from the Bremen faithful. Similarly, Bremen have also seemingly forgotten how to put the ball in the back of net. Since Schaaf took over he has rebranded Bremen as the premier attacking team in the league, outscoring almost every team over the years but this season they have struggled even in this department. Their talisman Pizarro has struggled with injuries and neither Hunt nor Marin have really filled the large vacuum left by Oezil. They have come to rely on disgruntled Hugo Almeida for goals and he was just sold. Tim Wiese has not been shy about his team's poor for this season. Best performer:Tim Wiese. With Bremen’s porous defense few goalkeepers have been busier than Wiese this season and as such he has done an admirable job. Wiese’s passion on the field is undeniable and amidst the chaotic Hinrunde he has stood out firmly above his teammates. He has bravely come out and criticized his own team’s shortcomings and has made no qualms about their disappointing performances. Wiese has built a reputation as a fantastic shot stopper and penalty specialist over the years and if it wasn’t for Germany’s resourcefulness in that position Wiese would be a guaranteed starter for the National team. Biggest disappointment: Bremen’s entire defense is culpable here and enough has already been said about how poor they have been. The problem has been compounded by the absence of Naldo, a key in Bremen’s defense as well as their build up from the back. The veteran and international regular Per Mertesacker has also been sub par and surprisingly prone to lapses in concentration. One of Mertesacker’s strengths has always been his tackle accuracy in one on one situations but this season he has one of the worst tackling % in his career. Bremen have also failed to find adequate fullbacks to match their game and have had to play with makeshift defenses on various occasions, sometimes even utilizing midfielder in their backline. Question – Can Bremen turn their season around? A lot of Bremen supporters believe that Schaaf’s time as manager has come to an end. Some have speculated that his style and coaching philosophy have simply worn out their welcome while others blame general manager Klaus Allofs for his deficiencies in the transfer market. Over the years Bremen have lost a lot of important players and failed to adequately replace them, Oezil being the latest. Surprisingly Bremen have just sold their most potent goalscorer and the pressure is on Schaaf and Allofs to find the necessary players in the transfer window. All that is compounded by Bremen upcoming schedule, which includes games against Bayern, Mainz, Hannover and Hoffenheim.